DME stands for Distance Measuring Equipment. It is a transponder (transmitter-responder) system that involves a ground-based facility and special equipment in the aircraft. DME supplies slant range distance in nautical miles between the station and the aircraft. Since the measurement is slant range, distance errors exist and are most pronounced when the aircraft is at high altitude relatively close to the DME station. To get relatively accurate readings, the aircraft's altitude should be 1000 feet per nautical mile from the station. 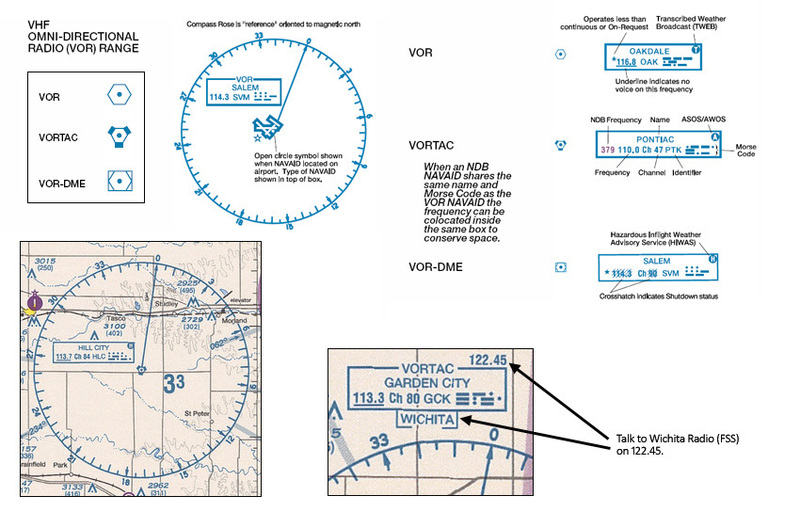 DME information is provided by VORTAC and VOR-DME, but not by standard VOR facilities. DME information may also be provided by some ILS facilities. A new form of DME navaid has recently appeared. These are standalone DME transmitters and are shown on En Route charts as small squares. Although the Instrument Knowledge Test doesn't yet include questions on these facilities, they probably will in the future. VOR stands for VHF Omni Range. It is a provided by ground-based transmitters. Navigation radios in an aircraft read the VOR (or VORTAC or VOR-DME) signals and deduce a bearing from the station. This bearing (FROM) is called a radial. Radials are relative to magnetic north as existed at the time of the station's calibration. Because magnetic north shifts over time, they may not correspond to current magnetic bearings. A large number of VOR stations are scheduled to be decommissioned. However, the FAA is retaining a limited network of VORs, called the VOR Minimum Operating Network (MON) to provide a basic conventional navigation service for operators to use if GNSS (Global Navigation Satellite System, i.e. GPS in the US) becomes unavailable. During a GNSS disruption, the MON will enable aircraft to navigate through the affected area or to a safe landing at a MON airport without reliance on GNSS. VOR receivers must be operationally checked for accuracy and logged every 30 days. The log entry must include the place, date, bearing error, and signature of the person conducting the test. The A/FD portion of the Chart Supplements publication lists available VOR receiver ground checkpoints (for testing) as well as VOTs (VOR receiver test facilities). VOTs transmit a single 360° radial in all directions. To test, set your OBS to either 360 with a FROM flag or 180 with a TO flag. (Memory aid: C182 - centered, 180, TO). Allowable tolerance is 4°. See §91.171 for precise details regarding VOR checks. Full-scale deflection of a CDI indicates that the aircraft is 10° or more off course, assuming en route sensitivity. Station passage has occurred when the first complete reversal of the TO-FROM indicator is shown.